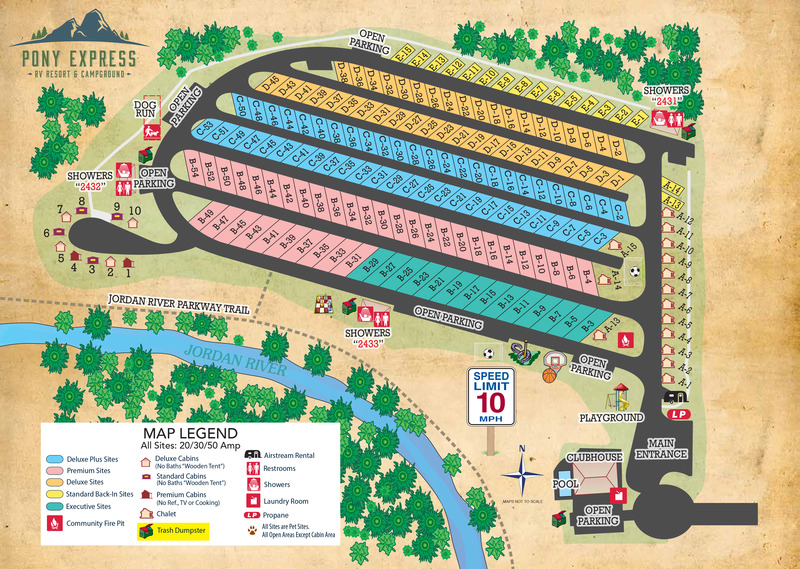 Ask fellow campers about "Pony Express RV Resort" and nearby attractions. Nice clean park. Large sites. Quiet. We camped at Pony Express RV Resort in a Fifth Wheel. We are halfway through a month long stay here. We have found this to be a well managed and cared for RV park. As others have said, it is not a quiet rural location. You'll hear traffic and airport noise. We did not find it annoying or bothersome. The Park's road are well paved and wide making navigation easy. We had a premium pull thru and we're glad we did. It fit our truck on the parking pad and our 43' tour hauler and both motorcycles with ease. WiFi was OK but we upgraded to the premium service dues to telecommuting work needs. There is a full array of stores just to the north plus a Flying J. We'll be back when in this area. We camped at Pony Express RV Resort in a Fifth Wheel. Beer fans should check out Kiitos Brewery in SLC. Top notch! We stayed four nights. First, this is your basic parking lot of RVs and you are definitely close together. We got a Deluxe space and I'm glad we did - most of these sites both had a cut-out space for your car, but also every site had a mature tree on it which provided shade. The less expensive spots mostly didn't have the trees which in the sun and heat are more prized than even the parking spaces! Otherwise, they have some resort features - a pool and nice kids' area, but really nothing else. You're off the freeway and there's a bunch of noise, especially if you're in the cheap seats. Due to the fall slump, there was a nice discount offered, and I would be very unhappy paying much more than what we spent. The main good thing was that you're very close to downtown Salt Lake City, and not far from I-84, so the location, even if mostly industrial, is workable. The bathrooms were generously sized and with decent water pressure, but the hooks were rather far away, rending it a bit awkward for showering. Not a big deal, of course, just a quirk. We might stay here again, but it's a pricey place for sure. We camped at Pony Express RV Resort in a Motorhome. Temple Square is definitely worthwhile. Whether or not you are LDS (Latter Day Saint or Mormon), it's part of our history of the Western part of the country. Plus, check out the Family History Library across the street. Even if you're not into Genealogy, it's great fun for the whole family. Nice open air mall right by the Square for eating and drinking. Also, the Bonneville Salt Flats - yes, it's 120 miles west of the city, but at 80 mph, it goes fast. Except for the cost, I think this was an excellent RV PK. This is the third time we have stayed here. It is close to the interstate, level paved site, FHUs w/ wifi and cable, grass between sites, very neat and well maintained. We did not use pool, their bathrooms or shower. The interior roads were very easy to navigate with our 40' mh w/toad. There is road construction on that exit but there are traffic lights. We camped at Pony Express RV Resort in a Motorhome. There is a Flying J at the same exit off of I-215 which I used but it was extremely difficult to pull out of with the traffic and road construction. Nice RV park and as others have indicated it's close to Temple Square and the Capitol, both worthy of a visit. Price paid was for a premium pullthru on the front row. Easy access and level. All utilities worked. I feel the rate is a bit high but it seems to be the way "resort" parks are now going. We were here for 3 nights and didn't use any of the facilities but enjoyed our stay. We did not notice any road noise and had no issues. We wold stay again if we were in the area. We camped at Pony Express RV Resort in a Motorhome. The Tabernacle in Temple Square has free Organ recitals daily at noon which we would recommend. A meal at the Red Iguana is also worthwhile, really good Mexican food, they are known for their different Mole's, just be prepared to wait at any time of day!! Nice park, noisy and few amenities close to the campers. Way over priced. Table at site is plastic. We camped at Pony Express RV Resort in a Motorhome. Very expensive cost/night vs. value. We stayed here because we enjoyed this resorts sister campground in Moab, UT. Although it appeared well laid out, half the roads were dead-ended, which meant one could not easily get to the parking space beside the site after disconnecting the trailer. The sites are quite close to each other, and we needed to park beside our trailer. On our first night the sewer fragrance made sleep quite difficult. We were in between two storm sewer grates. Once we moved, we found out on the subsequent nights that it was not the grates, but a sewer sanitation plant nearby. Mosquitoes were hell at night, since this area was once swampland.. The traffic from the I-215 was loud in the morning and evening, but the killer was the highway construction going on at the nearby interchange as well as I-215. The work went on ALL night. Apparently, because of the heat and the deadline, the work often goes until 3:00am or 5:00am. This is not, of course, the fault of the owners; but made for a less than satisfactory sleep. We did ask for an additional discount to compensate for this, and received it. Laundry was one of the cleanest we have used. Staff were exceptionally friendly and helpful. Would be a very good place if the price was at least $15 less per night and construction was not taking place on the Interstate beside it. 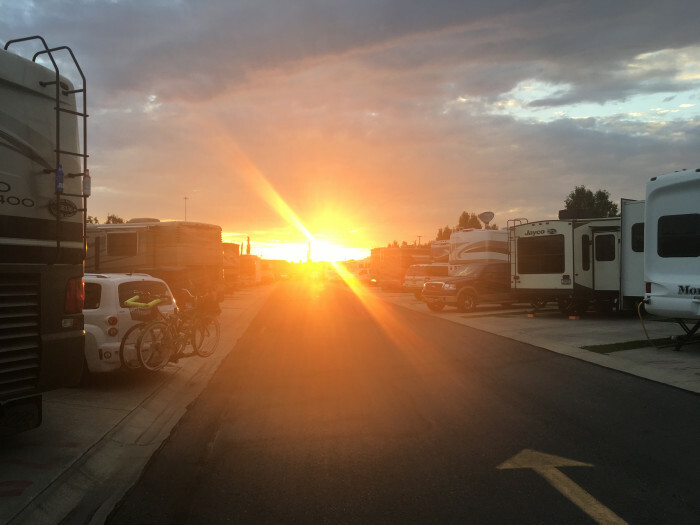 We camped at Pony Express RV Resort in a Travel Trailer. Pricey - but excellent park! Nice layout. Lots of parking for two vehicles. Clean. We had an end site lots of room. Paved sites. Good wifi and cable. We camped at Pony Express RV Resort in a Motorhome. Visit Capitol building - very interesting! Big Cottonwood Canyon is a great scenic drive. Absolutely one of the best parks we've stayed at - clean, spacious sites with concrete pads, full hookups, friendly staff, and great clubhouse and pool - what more could you ask for! 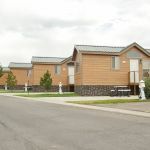 Now part of the Sun RV resort chain,this park is also only 10 minutes from Downtown Salt Lake. We'll definitely be back. We camped at Pony Express RV Resort in a Motorhome. This park is very expensive for what you get. We had to pay $10.00 extra so we can park our car next to the RV, which ended up to $54.94 because of military discount. If you don't pay the $10.00 you have to park somewhere and I was told it is first come first serve. The RV entrance was not very well marked so we drove into the RV Sales and were not very well treated. At least there was a way through and we could get to the park. We camped at Pony Express RV Resort in a Motorhome. Nice big, long sites, but ours was not level. Close neighbors, but not as close as some places we've seen. The sewer is located at the rear, so bring a long hose. Our picnic table was right by the neighbors sewer hose, so we moved it, as that was not a pleasant place to eat. The park has some nice amenities, but we wouldn't call it a "resort." There was a pool, but only one umbrella, and no other shade to speak of. In the mid-90s, some shade would be nice. They assured me they had ordered another umbrella when we asked if they had any more. So when it comes in, there will be a grand total of 2 shady spots by the pool...huh. No pool toys for community use--you had to buy them in the campground store. Easy to maneuver, nice wide roads. This RV park was just purchased by Sun Resorts, so they transitioned the internet while we were there. It still worked well, but they have you sign your understanding that it is not to be used for gaming or streaming movies (bummer). No shade in the hot summer sun at the sites. We camped at Pony Express RV Resort in a Fifth Wheel. 1.75 hours to Bonneville Salt Flats rest area and Speedway. 10 miles west is the historic Wendover Airfield, where bombers trained before using Fat Man/Little Boy. Independence Day and Con Air were filmed at the airfield. Climb the original tower and see the Officer's Club and museum. The town of Wendover will eventually have a Bonneville Speedway museum. Antelope Island is a fun stop, and we ignored the nay-sayers and swam at the beach. It was fun, even with the brine flies and shrimp. Well run and very clean. Some hwy noise from I-215 but not too bad. Great amenities with a clubhouse, pool horseshoe pits, playground and more. Had a little trouble with WiFi but they were changing providers that day so they get a pass on that. Just 10 min from downtown SLC. We camped at Pony Express RV Resort in a Fifth Wheel. New Park, spacious sites, most are pull-thrus. A great walking path is just outside the campground. We did not use pool. 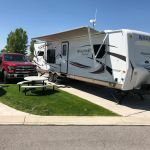 We camped at Pony Express RV Resort in a Fifth Wheel. This was a very nice park. Pros: Close to the city. Very clean. Sites were not crammed together. Sites were concrete and very level. The spaces were well maintained with a grassy area next to each site and a newer and well maintained picnic table at each site. The roads were large and easy to navigate. The camping area is gated. The clubhouse includes a pool table, foosball, nice little store that carries essentials, RV supplies, and gifts at reasonable prices. Other amenities included a pool, horseshoes, a nice fenced playground, outdoor chess, free coffee, and satellite showers and restrooms. Cons: The park is close to a freeway and freeway noise can be loud especially when the trucks use their engine brakes. This is more noticeable in the sites in the back rows. The park switched to a new internet service during our stay and it was very slow during peak hours. We camped at Pony Express RV Resort in a Motorhome. There is a RV sales and service company just in front of the campground. The park is on the north side of SLC. Very convenient to shopping (e.g. grocery, Target, Walmart, Costco) and many of the attractions to see in the city. Very close to the interstate highways, so there some road noise. However, when inside our camper it didn't bother us. The sites are concrete pads (and not quite level either) with asphalt roads. The sites are VERY close together and the many of the sites are very short. We had a 27 foot travel trailer and it just fit. We could not park our tow vehicle at our site (we were warned when making the reservation this would be the case) and had to park it in one of the overflow guest parking lots. The vehicle parking areas are also very tight and getting in and out was challenging. Fortunately, in our case our neighbors were accommodating and moved their vehicles to give me more room to exit. 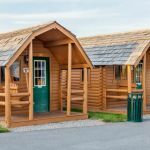 Despite the crowded conditions, the campground charges a reasonable rate and is very convenient to SLC attractions. The bathrooms were completely private (e.g. sink, toilet, and shower.) 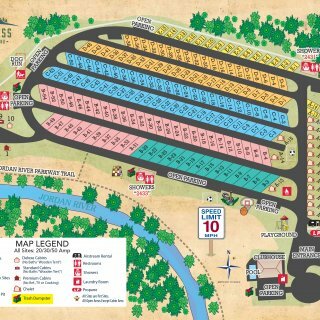 The campground is security controlled with gates on the road and combo locks on all bathrooms. The campground seemed secure, safe, and well lit. There is a oil refinery close to the campground. However, the prevailing winds are from the west and the refinery is to the east, so it was rare for us to smell anything from it. We would stay here again. 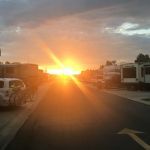 We camped at Pony Express RV Resort in a Travel Trailer. Olympic Park is a nice place to visit and worth the 1/2 day or so to travel there and tour the park. We also saw their ski jump show which was totally worth it. Any site in B or C is great. The higher the number the further away from clubhouse. If you want to go to the Temple in downtown SLC, learn about the parking beforehand. Most parking is underground, and we drove around and did not find any open entrances. If you need to go to Walmart, go to the Centerville one about 7-8 miles north. It is fairly new and in a very nice area with close mountains. Lots to do, many trails, This is the Place Heritage Park is nice, many parks and picnic areas around SLC, many nice mountain drives, days and days of things to do. There is a greenbelt bike path adjacent to the park with gate for users. Hope to return with bikes and check it out. Lots of recreation at park. Pool, kids play area, dog area, giant chess, horseshoes, etc. Park is gated and secure. Some construction near the exit but manageable. Convenient location for traveling in any direction. Utah is a photographer's paradise, if you do a google search on the National and State Parks in Utah, there are excellent guides (sorry, was not allowed to post the link). We came to SLC for the best in country Eye Institue of Utah, the Park was reasonably convenient. The SLC road grid designation system is...interesting...use your GPS. You can stay off the interstates by using Redwood, the main road outside the RV Park. Freeway accessible. Just far enough from Downtown. Visit the candy factory behind the flying J. They have great bags of "broken" candy. Being right across from a refinery, it wasn't the best part of town, yet it was easy access to almost all resources you might need. If you have time, spend an entire day on Antelope Island... buffalo, pronghorn antelope, cool birds, etc. can be found there and you can get pretty close to many. There is also a 19th century farm which makes for an interesting visit. We loved hiking the upper Albion Meadows Trail to Cecret Lake. We also liked the Doughnut Falls hike. The Saturday Farmers market downtown was wonderful. We really enjoyed the Thursday night FREE Mormon Tabernacle Choir rehearsal, downtown at Temple Square. Great shopping in nearby Bountiful. We enjoyed a side trip to the site of the 2002 Winter Olympics. Visit the Red Butte Garden east of the University of Utah. The view of the city is great and the gardens were beautiful. We met friends at shopping area in Farmington which was very nice. Also ate at the Red Iguana. It was ok but would not go back.. This rv park is so clean and the grass sites next to the cement pad were well manicured. There was a pizza place that delivered some of the best pizza and it was recommended by the stafff . Visit Utah State Capitol and Mormon Temple Square. Antelope Island State Park is another great day trip. Smith's Marketplace (several in the area) is a large grocery store with a good selection of products and produce. So much to do. Go to Ogden to see 4 museums in one place plus just south of Ogden is the Hill Air Museum. All well worth a full day. Salt Lake City Arboretum at the University is huge and amazing. It's about 1 hr drive to Promontory Summit where 2 railroads met to form the transcontinental railway. Also visit Antelope Island to enjoy The Great Salt Lake. Be careful not to turn down the wrong interior road. If you do, you won't be able to drive out, and you'll have to back your up. This RV park is right behind an RV dealer and service center. Also being right off I-215 makes it easy to get to. Half a mile away is a truck stop. There's a big RV Dealer with parts and service right next to the park. Beautiful area with nice mountains around in view. Catch the Mormon Tabernacle Choir rehearsal Thursday night. Close to everything in Salt Lake City. This park is located in an industrial area, nothing is within walking distance. RV Dealership with parts and repair service just in front of the park. Mobile service is also available, along with RV washing businesses. Flying J just across the freeway from the park. There is an RV repair service just in front of the park. Mobile service is also available, along with RV washing businesses. There is a RV place located at the road entrance - this was convenient since we needed a few things. Pretty close to everything with easy access on/off highway. Even though it's right off of the highway it wasn't terribly noisy. Of course the Great Salt Lake is a must see as is the Mormon Tabernacle Choir. For anyone looking, there are loads of jobs available in this city. Everyone is hiring. There's an RV dealer and parts store right next door. Close to the water slide parks. SLC International Airport close by. Pilot truck stop on the other side of the freeway. Near by traffic and airport not a problem with AC/fans operating. 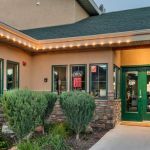 Easy access to lots of shopping, restaurants, downtown, bike paths and not too far from Antelope Island. Parking for oversized vehicles is available at SLC airport for same rate as car parking, but obviously, you cannot "camp" there. Since this campground is only 9 miles away via expressway, it was convenient for an early morning flight. Also, right next door is an RV dealer and service center, which is convenient. SLC-UT lacks a high quality RV Resort. Ensure your trip don't "overnight" you there. If you can request a space facing the open area south of the park. Best spaces and no one in front of you to block your view. We just stayed in the park area. Pilot gas station within half mile, RV park is next to the freeway for easy access. Noise did not bother us. We loved the adjoining bike trail and easily rode to downtown SLC, about 5-7 miles one way. The Jordan River Recreational Trail is accessible directly from the campground and offers miles of paved trail for biking, walking or running. The campground is about 5 miles from the downtown attractions in Salt Lake City. It is also near the airport. We were visiting family nearby so didn't care much where we were located. Industrial area not close to anything. Nice walking path along the river. Closest store is 2-3 miles away - south on Redwood. If you need your rig cleaned, ask at the desk for a card for Clean Rite Power Wash. This guy is awesome and reasonable. Don't forget to take in downtown Salt Lake City. Great place to spend the day. 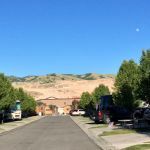 The city of Bountiful is close by with everything you need including restaurants, grocery stores, and gas. Make sure they enter your gate code correctly. Are you affiliated with Pony Express RV Resort ?